THE PILOT FULLY OPENS THE THROTTLE just before the catapult is released. The acceleration of the catapult, combined with the pull of the propeller, enables the aeroplane to attain flying speed before it reaches the end of the catapult runway. This picture shows an aeroplane mounted on the catapult at the No. 1 RAF flying training school at Leuchars, Scotland. The crane in the background is used to lift the aeroplane into position on the catapult. CATAPULTED into flight from the deck of a ship lying off the coast of Devon, on March 27, 1938, a German flying boat established a world’s long distance seaplane record by flying non-stop to Brazil. The distance covered was about 5,220 miles, and the flight provided a striking example of the value of catapult launching in long-distance flying. Aircraft can always fly with a bigger load than that with which they can take off. On this German flying boat, a Dornier Do.18, driven by two 600 horse-power heavy oil engines, the load of fuel necessary for the transatlantic flight was so heavy that the flying boat could not have risen off the water unaided. The extra power needed was, therefore, supplied by a ship-mounted power-driven catapult, which so accelerated the take-off that by the time the aircraft had reached the end of the catapult runway it had already attained flying speed and was thus able to support its weight unaided. This augmentation of an aircraft’s range by assisted launching is, however, a comparatively recent adaptation of the catapult. The introduction of the catapult dates back to the pioneer days of Langley and the Wright brothers, who used primitive forms of catapults to launch into flight aircraft whose engines were not powerful enough for the take-off. More recently, the development of the power-driven catapult has been due to its military and naval value as a means of launching aircraft under conditions which do not allow a normal take-off, such as from the deck of a ship or from a restricted area on land. So efficient has the catapult proved itself in this capacity that it is today regarded by naval authorities as being no less an essential part of a cruiser’s or battleship’s fighting equipment than are its guns or torpedo tubes; for it is on aircraft that a modern fleet relies for reconnaissance as well as for directing the fire of its guns. The aeroplane catapult is an apparatus whereby, in a short distance, an aircraft can be accelerated from rest to the speed at which it becomes air borne. There are various types of modern catapults, but they are all fundamentally similar. Each consists of a carriage, or trolley, on which the aeroplane is mounted, a motive plant which causes the aeroplane-laden trolley to travel at increasing speed along a prepared runway, and a means of arresting the progress of the trolley after the aeroplane has reached the necessary flying speed. The energy for the motive plant may be derived from compressed air or, as is the latest practice, from some form of slow-burning explosive powder, such as cordite or melinite. It might seem that a steady and uniform acceleration throughout the launch would be necessary. Considerations of the effect on the aeroplane of the loads and stresses involved during catapulting have shown, however, that the best result is obtained when the greatest acceleration occurs almost immediately after the start of the launch and when the aerodynamic forces are virtually negligible. The acceleration should then gradually decrease and become least at the end of the launching run, when the aerodynamic forces acting on the aeroplane’s structure are at their maximum. The cover of Part 24 shows a Walrus being catapulted from HMS Sheffield, while the vessel was under way. The Walrus is a single-engined amphibian, specially designed for fleet-spotting duties. The amount of power needed to operate the catapult and the length of the runway required are largely governed by the strength of the aeroplane and by the speed at which it becomes air borne. An acceleration of between 3g. and 4g. (i.e. three or four times that of a body falling freely under gravity, corresponding to a force of three or four times the aeroplane’s own weight) is normally about as much as the average aircraft’s structure will safely stand. The human element is not the limiting factor, as the acceleration, being applied in a horizontal direction only, does not set up stresses nearly so great as those involved by certain aerobatic manoeuvres or by sharp turns at high speeds. The crew of a catapulted aircraft could, it is estimated, withstand accelerations of 5g. or even more, without loss of consciousness, though to most people with experience of catapult launching the discomfort involved by the present rate of acceleration is already considerable. To avoid injury, such as a possible dislocation of the neck, it is necessary for the pilot, tightly strapped into his seat by a broad canvas belt, to press his head firmly back against a padded headrest and to brace his legs against the rudder bar. The crew may either lean forward with their heads between their arms, so as to take the accelerating force down the spine, resting their hands with arms extended on the cockpit, or they may face aft and pull with all their strength on a cross-bar arranged across the cockpit, at the same time bracing their legs and pressing their bodies firmly into their webbing belts. The aeroplane on a modern power-driven catapult is generally mounted on the launching trolley in a level flying position; that is, with its wings at a fairly large angle of incidence. Just before the trolley is set in motion the aeroplane’s engine, previously warmed up, is opened full out, the trolley being prevented from moving forward under the pull of the airscrew until the launching force is applied. Then, impelled by the combined forces of the launching charge and the airscrew pull, the trolley and aeroplane together gather speed. The air loads on the aircraft increase until, by the time the end of the runway has been reached, the aircraft has attained flying speed and leaves the trolley, which is automatically arrested at the end of its run. In the early days of flying an assisted take-off was essential for the attainment of the necessary initial flying speed. The early aeroplanes were lightly loaded and did not need a high speed to become air borne. Thus it was possible to use a simple form of catapult. A weight falling by gravity transmitted its force to the trolley on which the aeroplane rested, through a cable passing over a pulley wheel at the end of the runway along which the aeroplane travelled. That aircraft could take off under their own power from the restricted space of an improvised platform erected on the deck of a warship had already been demonstrated by 1910. In that year Eugene Ely successfully took off a machine from the forecastle of the U.S.S. Birmingham. Large structures, however, apart from their vulnerability, so interfered with the fire of the ship’s guns that further experiments with shipborne aircraft were abandoned until the next year. In 1911 Glenn Curtiss demonstrated the ease with which a seaplane could alight alongside a man-of-war and be hoisted inboard, and the U.S. Navy again became interested in the possibilities of aircraft cooperation. 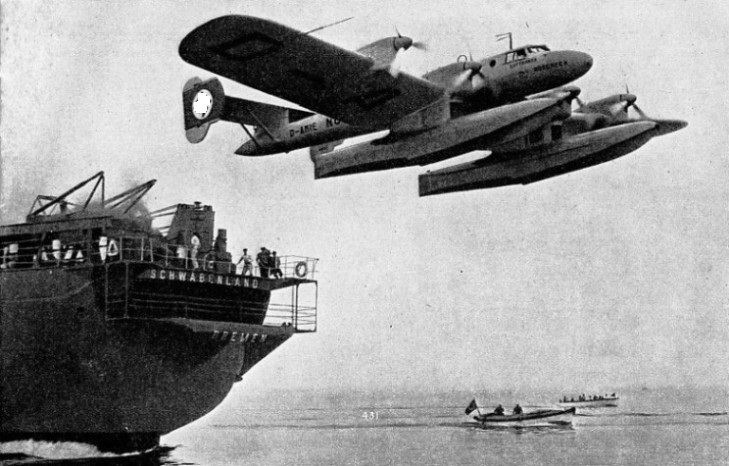 It was soon discovered, however, that though a seaplane could alight on a rough sea, it needed relative calm for the take-off; and it became obvious that if seaplanes were ever going to be of any practical use to a fleet some method would have to be devised for launching them directly into flight from the deck of the ship. A CATAPULT WITH TELESCOPIC PISTONS to provide the accelerating force. The picture shows the pistons extended and a Supermarine Seagull, Mark V amphibian being fitted to the catapult trolley. Several types of telescopic-piston catapults were developed at the Royal Aircraft Establishment, Farnborough, during 1922 and in later years. Compressed air was used as the propellent in the first model, but cordite was used later as the propellent. In 1911 Captain Washington Chambers, an American naval officer, designed the first power-driven aircraft catapult, which was built under his supervision at the U.S. Government’s Ordnance Factory. His catapult consisted of a twin-railed runway, 30 feet long, along which travelled a wooden trolley pulled by a system of wires. After the wires had passed over a pulley at the end of the runway, they were attached to the crosshead of a piston, or ram, working in a cylinder of compressed air. The mean acceleration was 2·3g. and the maximum speed attained at the end of the run - during which both the aircraft and the trolley were free to lift from the runway at any time - was about forty-six miles an hour. The first test of this catapult took place on July 31, 1912, at the Annapolis naval base, Maryland, where the device had been assembled at the edge of a dock. A seaplane, with Lieut. T. C. Ellyson, of the U.S. Navy, as pilot, was mounted on the trolley. In the middle of the run, however, when flying speed had almost been reached, a sudden cross-wind gust unbalanced the machine and it fell off the trolley into the water. Neither the pilot nor the machine suffered any great ill effects and both contributed valuable information to the inventor. The machine had suffered no structural damage under the accelerative stresses; the pilot had found that the rapid acceleration had not, contrary to expectation, caused a loss of consciousness or any discomfort. 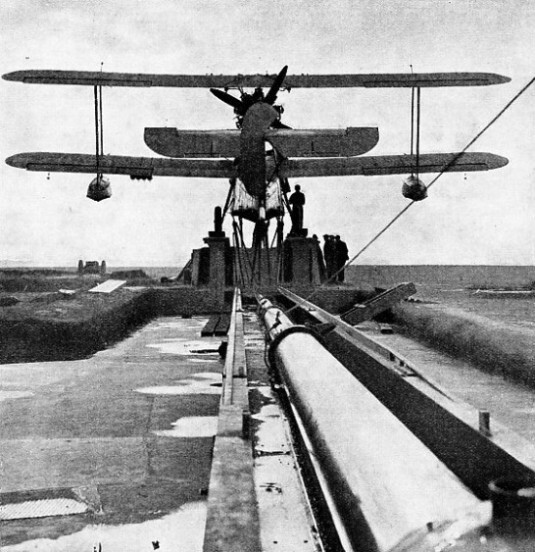 Modifications were then made to the catapult, the most important being a device for securing the seaplane to the trolley until the end of the run was reached, and the up-tilting of the end of the runway to throw the machine into the air. The apparatus was then installed in a coal barge at the Washington Navy Yard, and on November 12, 1912, the first successful launch of an aircraft by a power-driven catapult was achieved. Lieutenant Ellyson was again the pilot. For a while, catapulting formed part of the normal routine training for U.S. Navy pilots, though it was not until three years later, in 1915, that a catapult was installed on board a ship. The U.S.S. North Carolina was chosen for the experiment and several successful launches were made from her during subsequent fleet manoeuvres, first while running at about 6 knots and later at a normal cruising speed. The North Carolina’s catapult was an improved version, and consisted of a steel structure, some 60 feet long, permanently secured to the ship’s quarterdeck, with the runway about four feet above the deck level. The compressed air which supplied the motive power came, at first, from an improvised tank, but this leaked so badly that the supply was afterwards taken direct from the ship’s torpedo air service, which gave a pressure of 300 lb. to the square inch. In 1916, similar catapults were installed on the quarterdecks of the two American armoured cruisers Seattle and Huntington. In the North Carolina an experiment was tried by moving her catapult from the quarterdeck to the rotatable top of the after gun-turret. It then became possible to train the catapult in almost any desired direction for launching the seaplane head into wind, a great improvement on the previous method where, with the catapult fixed to the quarterdeck, it had been necessary to alter course or stop when launching. So far, credit for the introduction and development of the aircraft catapult had lain almost entirely with the United States. It was not until the middle of 1916 that the British authorities, faced with much the same problems of carrying aircraft in capital ships as America had experienced a few years earlier, gave serious attention to the catapult as a possible solution of their difficulties. AN AEROPLANE CARRYING MAIL is regularly catapulted from the German liner Bremen when she is about 800 miles from her destination. Experiments on these lines were begun in 1928 from the French liner lle de France. The catapult was fitted to the Bremen the following year, and in 1931 the Bremen’s sister ship, the Europa, was similarly equipped. In 1916 tenders were invited for the building of a catapult in Great Britain, and the specification required that it should be capable of launching a 21-tons aeroplane at a speed of 60 miles an hour with an acceleration not exceeding 2·5g. in a distance of 60 feet. As it was intended for shipboard use, it had to be as light and as compact as possible, but contractors were given a free hand as to the operating mechanism or motive power to be used. Two different types of catapults were eventually ordered and built to this specification. Both used compressed air and were generally similar in design to the ones already in use by America. The first to be completed was built to the designs of R. F. Carey and was tested with a Sopwith Pup scout aeroplane at Hendon Aerodrome, in October 1917. The other, installed in a barge, was given its first tests early in 1918 off the Isle of Grain, at the mouth of the river Thames. Neither, however, came up to the rather ambitious specification, and with the signing of the Armistice the authorities temporarily lost their enthusiasm for further experiment. Once again the initiative passed to the United States, and towards the end of 1921 the first tests were made of a new catapult, the invention of an American naval officer. The new catapult was a great advance on any previous design. It was a compact, self-contained model of the rotatable type, capable of launching at a speed of 55 miles an hour an aeroplane weighing 3,500 lb. This type proved so successful under tests at sea that, by 1925, some thirty-two catapults of the same pattern had been installed in U.S. Warships. Another American development of this period, and one destined to have a revolutionary effect on future catapult design, was the introduction of explosive powder as a propellent in place of compressed air. The originator of this idea appears to have been an officer of the U.S. Coastguards, Lieut.-Com. Hamlet. By 1924 the first powder-operated catapult had been built and installed on top of a gun-turret of the U.S.S. Mississippi. Similar in external appearance to the compressed-air type then in use, it consisted of a steel lattice-girder framework, 50 feet long, and a trolley connected by wire ropes and pulleys to the ram of a cylinder. This cylinder was connected by a pipe to the chamber in which the charge was exploded. The speed of the launch was estimated at about 50 miles an hour, and the trolley was arrested at the end of the runway by hydraulic buffers. The first sea-going tests were carried out with some trepidation, but it speedily became apparent that the new catapult was to be an outstanding success. Not only did it make possible the accurate control of the launching force applied, by permitting a variation of the amount of powder used, but it also greatly accelerated the operation and permitted any number of machines to be launched as quickly as they could be loaded on to the catapult. When compressed air had been used a long delay between launches had been necessary while the air tanks were being recharged. So enthusiastic were the American naval authorities over this new catapult that it was decided to standardize the powder-impulse type throughout the U.S. Navy. Meanwhile, Great Britain had turned again to catapult development. Orders for two experimental models were placed in the autumn of 1922. One was built at Chatham Dockyard, Kent, to the design of R. F. Carey, who had built the one previously tested at Hendon; the other was designed and built at the Royal Aircraft Establishment at Farnborough. 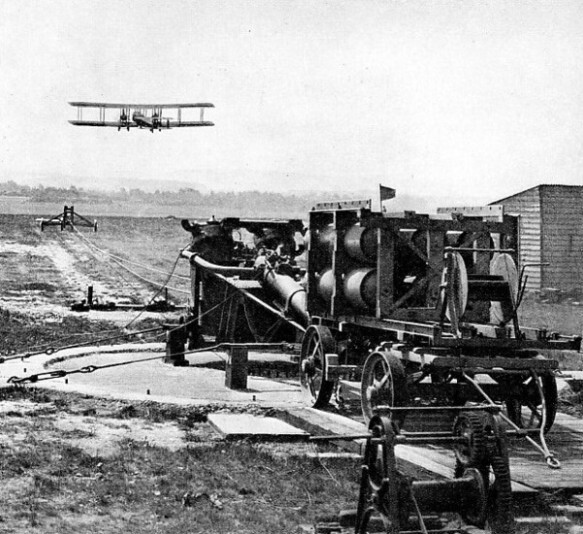 LARGE AIRCRAFT CAN USE SMALL FIELDS with the aid of this field accelerator developed by the Royal Aircraft Establishment. It differs from the types of catapult used in ships in that only the tail of the aeroplane is raised and attached to the catapult trolley. The aeroplane is pulled forward by a cable passing over a pulley fixed in the ground. The Carey catapult, in which the force of the compressed-air ram was communicated to the launching trolley by the usual series of wires and pulleys, was installed in the cruiser Vindictive in 1925. It was set up on the foredeck, from which the guns had been removed, on top of a special hangar which had been built forward of the bridge. The aircraft were hoisted inboard by a crane which was used also to lift them into position on the trolley of the catapult. 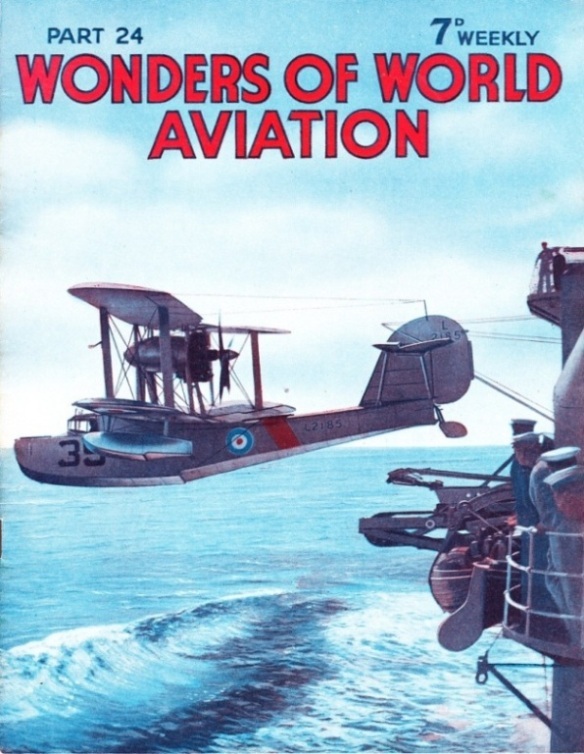 The first flight from the Vindictive catapult was made on October 30, 1925, by Wing Commander Burling, R.A.F., piloting a Fairey 3D twin-float seaplane. During the following two years, when the ship was on the China station, the catapult was in constant use and proved a complete success. The second type of catapult, designed by the Royal Aircraft Establishment, was equally successful and was notable for its novel form of actuating mechanism. Compressed air was still used as the propellent, but the wires and pulleys were replaced by a series of telescopic pistons, or rams, which shot out simultaneously when compressed air was admitted into the cylinder. The launching trolley on which the aeroplane rested was attached to the smallest, or outermost, ram; and the catapult could launch aeroplanes up to 7,000 lb. in weight at a speed of 15 miles an hour within a distance of 34 feet, the mean acceleration being approximately 2g. The structure consisted of a 50-feet rectangular girder, 3 feet high by 3 feet broad, so mounted that it could be rotated to point directly into the prevailing wind. Installed in a pit on Farnborough Common in 1924, this R.A.E. catapult proved so successful that two more were built on the same principle. One was installed in H.M.S. Frobisher about the end of 1927. Results, however, were still inferior to those obtained in America, and the authorities recognized the superiority of the powder-impulse type, which had been standardized in the U.S. Navy since 1925. In May 1928 the R.A.E. catapult, which by then had several thousand successful launches to its credit, was modified to take a cordite charge in place of compressed air. The results were as successful as they had been in America and, shortly afterwards, the first cordite-operated catapult to be installed in a British ship was mounted in H.M.S. York. Other types of cordite-impelled catapults soon followed, including two more designed by the Royal Aircraft Establishment. Both of these incorporated the same multi-ram principle which had been so successful a feature of the prototype. Though normally 82 feet long, these catapults could be folded to 44 feet, for stowage on board ship. One catapult, capable of launching an aircraft of 5,000 lb. weight at a speed of 55 miles an hour, was installed in the cruiser Kent. The other, designed to launch aircraft up to 7,000 lb. in weight, went to H.M.S. Hood. Various other types of catapults have since been developed in Great Britain and are in use today in many of the capital ships and cruisers of the Royal Navy. Two examples, a number of which are in service, are the Forbres extending-type catapult, which launches an 8,000-lb. aircraft at 57 miles an hour with a run of 50 feet, and the “Slider” catapult, in which the launching trolley is itself mounted on a subsidiary structure, or slider, which travels with it along the runway. CATAPULT SHIPS ARE USED AS BASES for seaplanes operating the German air mail service across the South Atlantic. The seaplanes land beside the ships, are lifted on board by cranes, and, having been refuelled, are catapulted off again. This picture shows the Nordmeer leaving her parent ship for a flight to survey the possibilities of a similar air mail service to New York. In virtually all types, a cartridge of cordite or some similar slow-burning powder serves as the propellent and some combination of wire ropes and pulleys in conjunction with a single ram provides the actuating mechanism. The same description, in general terms, may also be said to apply to most other types of aircraft catapult in use by the principal air and sea Powers today. All regard the ship-borne aeroplane with its catapulting apparatus as an essential part of the fighting equipment of modern battleships and cruisers. In some instances, even destroyers and submarines are thus equipped. One form of catapult differs appreciably from any of the normal types. 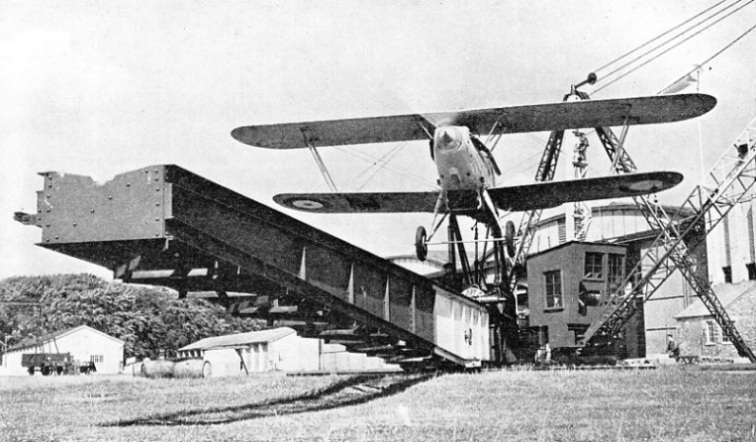 The Aeroplane Field Catapult, or Accelerator, has been developed by the Royal Aircraft Establishment to enable heavily-loaded aeroplanes to fly out of fields which would otherwise be too small for an unassisted take-off. In this type only the tail of the aeroplane is raised and mounted on a trolley or small truck. The aircraft is hauled over the ground on its own wheels by a cable which is led over a pulley fixed in the ground some 60 yards ahead of the catapult and thence back to a revolving drum on the catapult, driven by a 4,000 horse-power compressed air engine. To launch an aeroplane with the Field Accelerator, the engines of the machine are opened full out and, simultaneously, the catapult’s winding drum is set in motion, its cable pulling the aeroplane down the runway at high speed. At the end of the run the catapult engine is automatically shut off, a brake is applied to the drum, the tail truck is suddenly arrested and the aeroplane, which by then has almost attained flying speed, proceeds to take off under its own power. The Field Accelerator enables aeroplanes up to 18,000 lb. in weight to reach 60 miles an hour in a run of 120 feet, the mean acceleration being 1g. As a means of enabling large bombers to take off with heavy overloads, or reconnaissance machines to operate from otherwise impossible landing grounds, the Field Accelerator is a development of military importance and of great possibilities. The first merchant vessel to install a catapult was the French liner lle de France. In 1928 a series of successful experiments was made to expedite the delivery of transatlantic mails from this vessel by the launch of a mail-carrying aircraft while the ship was some 400 miles from New York. The flying boat thus catapulted reached New York within four and a half hours, forestalling the arrival of its parent ship by nearly a day. 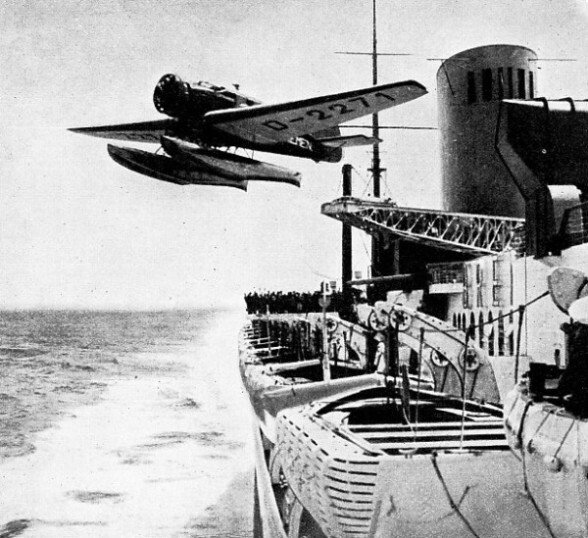 Similar experiments on the same route were made the following year by the Norddeutscher Lloyd, which installed a rotatable catapult on the top deck of the liner Bremen, so that the Heinkel seaplane which she carried could be launched directly into wind without alteration of the ship’s speed or course. In 1931 the Bremen’s sister ship, the Europa, was similarly equipped. Since then, the two ships have maintained a weekly air mail delivery service throughout the summer months, catapulting their seaplanes about 800 miles from their destination and so effecting a great saving of time in the delivery of mails. The most notable achievement of the catapult in commercial flying is, perhaps, to be found in the regular air mail service operated by the Deutsche Lufthansa between Berlin and Buenos Aires since February 1934. The route involves a 1,900-miles crossing of the South Atlantic between Bathurst, Gambia, West Africa, and Natal, Brazil. Catapult ships are permanently stationed off either coast and serve as launching platforms and refuelling bases for the large Dornier Wal flying boats which operate the transatlantic link of the service. At either end of their journey, the flying boats alight alongside the catapult ship, are picked up by crane, refuelled, placed on the catapult and launched into flight on their return journey. This method, by keeping to a reasonable length the stages to be covered by each flying boat, permits the carriage of a useful commercial load and ensures that the aircraft are able to take off, however rough the surface conditions of the water may be. THE TROLLEY IS AUTOMATICALLY STOPPED when it reaches the end of the runway on the catapult and the aeroplane is released. This photograph, taken immediately after the machine had left the trolley, shows another view of the catapult at Leuchars, illustrated at the top of this page. Pilots of catapulted aircraft have to take special precautions to prevent dislocation of the neck due to the sudden acceleration. 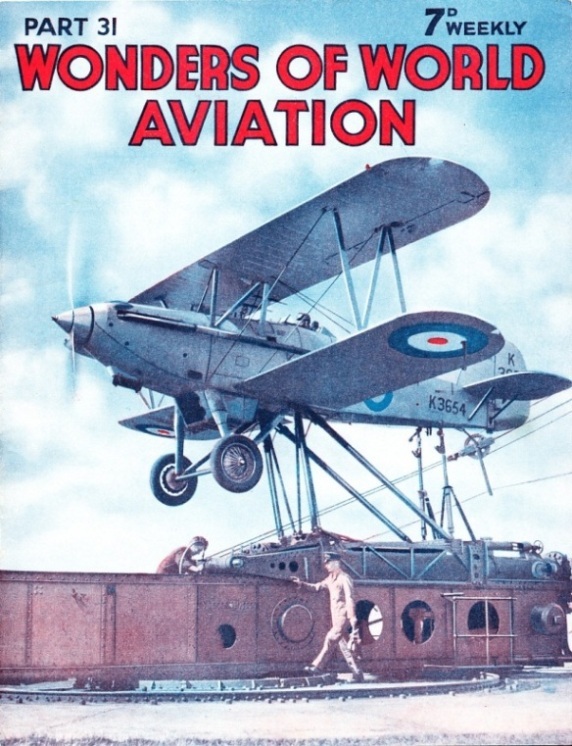 The cover of Part 31 shows a Royal Air Force biplane about to be launched from a catapult at No.1 RAF Flying Training School at Leuchars, Scotland. You can read more on “The First Aviator to Fly the Channel”, “The Influence of Air Racing”, and “Showman Who Turned Aviator” on this website.